Aurora Dancewear & Costume Limited Unit 6, Rufus Business Centre, 22 Ravensbury Terrace, Earlsfield, London, SW18 4RL, United Kingdom. Artistic Collage from American Artist Valerhon "Trial by Steel"
Nylon Lycra or cotton Lycra . Front zip (may be worn zipped or unzipped). Nylon Lycra or cotton Lycra bottom. High neck with stud fastening. 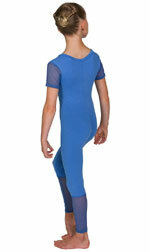 Nylon Lycra or cotton Lycra and velvet Lycra.